The image above is taken from the Yukon First Nations Health Promotion Spring School 2007 report. Click on it to download to download just the Food Security section as a PDF-format excerpt from the report. “exists when all people, at all times, have access to sufficient, safe and nutritious food to meet their dietary needs and food preferences for an active and healthy life”1. “is the right of peoples to healthy and culturally appropriate food produced through ecologically sound and sustainable methods, and their right to define their own food and agriculture systems”2. “As Indigenous People we understand that food is a gift and that we have a sacred responsibility to nurture healthy, interdependent relationships with the land, water, plants and animals that provide us with our food. This also means, having the ability to respond to our own needs for safe, healthy, culturally relevant indigenous foods with the ability to make decisions over the amount and quality of food we hunt, fish, gather, grow and eat. These rights are asserted on a daily basis for the benefit of present and future generations. ”3. 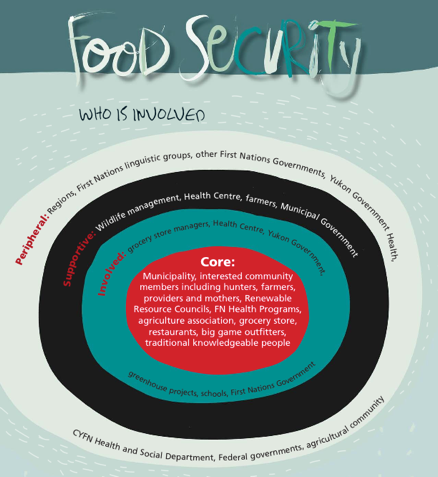 Food security and food sovereignty are pressing issues across the Yukon and the North and have been identified as priority concerns for the health and well-being of northern residents, and particularly for Indigenous citizens. The ability to access sufficient amounts of nutritious and safe foods affects northerners in different ways. For example, accessing foods harvested from the land can be challenging with changing land conditions, high fuel and equipment costs, and changes to wildlife health and migration patterns. Store-bought foods can be very expensive, of poor quality and poor selection and are also vulnerable to climate change because of transportation and supply routes from the South to changing environment. The Council of Canadian Academies published a landmark report earlier this year titled Aboriginal Food Security in Northern Canada: An Assessment of the State of Knowledge4. This report emphasizes the serious challenges northern communities are facing with respect to food security. The Report also notes that “...the Arctic Institute of Community-Based Research...[is an] important resource for current and future research and policy development related to food security and northern Aboriginal peoples” (ibid. p.xxi). AICBR works closely with communities to facilitate a process whereby communities identify their own needs, lead the research process and develop their own strategies for action in the areas of food security and climate change in particular. See our projects page for more information on these community-led, collaborative projects. We have also hosted multiple workshops and training projects focused on food security since 2007. These efforts have reached over 500 people, including youth, and our workshops and community-based research and training have built capacity for ongoing efforts to improve food security and food sovereignty across the Yukon. More recently, we have been working with Yukoners to identify what the major regional factors are which are affecting food security, as well as working towards addressing some of the issues. Over the last five years, AICBR has been supporting the Yukon Anti Poverty Coalition to host bi-monthly Food Network Yukon (FNY) lunch sessions, which bring people from various areas of the food system together to discuss and work together to address local food security and food sovereignty issues. Everyone is welcome to participate in these meetings and can contact us for more information at info@aicbr.ca. On a pan-Canadian scale, AICBR is a member of Food Secure Canada and together with them co-hosts the Northern Food Network (NFN). The NFN webinar series welcomes participants from across Canada to hear and learn from Northern speakers who show leadership in the areas of food security, health, environment and agriculture. In all of our work, we take a community-based, participatory approach to researching, educating and advocating for food security and food sovereignty in the North. Raising up Northern voices and informing policy so that it is relevant, respectful and results in action is also a key part of our food security work. Between July and November 2017, we worked with the Yukon Anti-Poverty Coalition with support from Food Secure Canada and Trudeau Foundation to advocate for a strong focus on northern food security and sustainable northern food systems as part of the emerging "A Food Policy for Canada" that the federal government is developing. Read more about what Yukoners had to say about their priorities for this emerging national food policy. 1. Federal Agricultural Organization of the United States (FAO). (2009). Declaration of the World Summit on Food Security. World Summit on Food Security Rome, Italy: 16‐18 November 2009. 3. First Nations Health Council. (2009). Healthy Food Guidelines for First Nations Communities. First Nations Health Council, British Columbia. 4. Council of Canadian Academies (2014) Aboriginal Food Security in Northern Canada: An Assessment of the State of Knowledge, Ottawa, ON. The Expert Panel on the State of Knowledge of Food Security in Northern Canada, Council of Canadian Academies. Northern Food System Inventory Map - help us build a comprehensive picture of food systems in the North!